The concept of financial independence and securing a financially comfortable position in life is one many strive to achieve. For some, the idea of never having to worry about money again is as improbable as it is impossible. Fortunately, financial independence isn’t impossible, but rather entirely obtainable for those who are willing to work for it. With the right plan in place, a mind for due diligence, and a cash-flowing real estate portfolio, financial independence may only be a few rental property acquisitions away. If for nothing else, real estate is one of the greatest wealth-generating investment vehicles implemented by today’s investors, and there’s nothing to suggest it can’t do the same for you. Financial independence is an economic indicator suggesting someone is no longer dependent on income generated from any type of job or activity that would have them trade their own time for money. Instead of relying on income generated from a traditional nine-to-five or a career, financially independent individuals are entirely capable of supplementing their most basic needs with a more passive source of income. In other words, those that have been deemed financially independent rely on a previously assembled portfolio of assets to generate income that is either equal to or greater than their expenses. Perhaps even more importantly, however, financial independence offers those who attain it the freedom to have control over their own time to devote to their families, passions and interests. Get Control Of Your Money: The first step in achieving financial freedom is to finally gain control of your money. It is time to start spending less than you earn. While this task sounds simple enough, there are far too many people drowning in debt. Therefore, before you even think about realizing financial independence, you need to get control of your money and manage your expenses accordingly. While facing monthly expenditures can be scary, it’s extremely eye opening and incredibly necessary. In doing so, try to follow the 50/30/20 budgeting rule: spend 50% of your budget on “needs” (groceries, utilities, insurance, etc), 30% on “wants” (shopping, dining out and hobbies), and put the remaining 20% in savings. Get Rid Of Unnecessary Expenses: Implementing the 50/30/20 budgeting rule will give you a good idea of where your money is going. Once you have a good idea of where your own money is going, evaluate your own 50/30/20 budgeting rule and find out where you can get rid of unnecessary expenses in the “wants” section. Remember, nobody makes money by spending too much of it. Therefore, take a good look at your new budget and find ways to cut out spending. Most people will find they can cut back on dining out expenses. When you’re striving for financial freedom, these things are luxuries you can do without. Boost Income & Productivity: At some point, expenses become necessary and can no longer be cut. Once you have eliminated any and all unnecessary spending, the next logical step to take is to increase your income and productivity. At this point, you’ll want to start finding ways to put your money to work for you. Instead of keeping the money you have in a savings account where it’ll inevitably lose value to inflation, try finding ways to increase your net worth. Performing real estate investment trusts (REITs), for example, can simultaneously offer comparable returns to the S&P 500 while hedging against inflation. On top of that, good REITs reward shareholders with dividends that can improve their prospects over the long run. If REITs aren’t your thing, consider boosting your productivity with a sound real estate education. Take some time to educate yourself on the many real estate exit strategies people use to realize their own financial freedom. Listening to a financial independence podcast is a great place to start, or you could even read several financial independence books. The ability to educate yourself is almost limitless. Enlist A Financial Advisor: One of the best steps you can take is to enlist the services of someone that has already accomplished what you hope to one day. Seek the help of a financial advisor who can point you in the right direction. There are most likely several steps you can take immediately to place yourself in a better financial position, and a good advisor can keep you on track. A good real estate education can mitigate risk. The fewer problems you encounter, the better your chances of realizing a higher return on investment (ROI) are. The more an investor knows about the industry, the more opportunities they’ll be presented with. Exercising your knowledge of the real estate industry is the surest way to build a real estate network, which typically translates into an investor’s greatest asset. To see to it that your education is the greatest asset you have at your disposal, learn as much as you can about the real estate industry and any particular exit strategy you hope to execute. 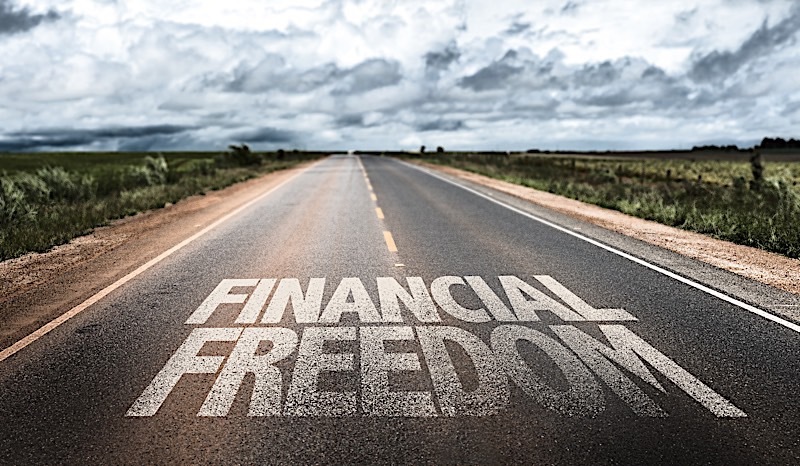 Regardless of what you have heard in the past, there isn’t a universal number each and every person hoping to achieve financial freedom needs to reach. There is no finish line that, when crossed, will automatically rid you of your dependance on the income generated from a job. That said, how much money you need to make to realize financial independence will depend entirely on the lifestyle you hope to live—including spending habits. Remember, how much money you make is just as important as your spending habits. That said, the best thing you can do is look at your current financial situation. If you are comfortable with your current income, your goal should be to replicate it with the passive income generated from a portfolio of rental properties. Of course, you may adjust your own number to fit your personal preferences. Once you have a solid real estate education and your financial independence goals are set, it’s time to start taking action. The best place to get started is by researching financing options so you can begin looking for your first deal. Most new investors won’t have the money it takes to require an entire portfolio of rental properties, let alone a single asset. That said, there’s no need to invest with your own money. Fortunately, there are several ways aspiring investors can gain access to funding, the most promising of which is a private money lender. A private money lender is an investor who makes loans to those in need of immediate access to capital. While they may serve the same purpose as a traditional lending institution, there are several key differences: private money lenders typically charge higher rates than banks, but will also make loans that the average bank would usually pass on. It is important to note the difference between the two. While banks and similar lenders may offer the most attractive rates, they do not provide the same combination of speed and transparency in the decision-making process. Investing in a single property is a great first step, and a necessary one at that. If for nothing else, you can’t possibly realize financial freedom with one deal, let alone your first one. Therefore, your goal shouldn’t be to compete a single deal, or even two or three, but rather to do enough deals until you are financially stable to build a rental portfolio. To build an investment business, most investors will resort to using other people’s money. Private moneylenders, as they are typically referred to as, allow prospective investors to buy and acquire assets they would otherwise not be able to afford. More specifically, private money lenders will fund the investor’s purchase in return for making the money back with interest, oftentimes as high as 12 to 15 percent. That way, the investor gets their deal, and the lender makes money on the back end. It is worth noting, however, that private money lenders are more than just a source of funds; they are the gateway to building an entire investment business. The money borrowed may come at a steep price, but when due diligence is minded, the cost is well worth the investment. Done correctly, borrowing funds from a private money lender will net you profits—profits that can be used to help you build a business, and eventually allow you to build the one thing all investors view as the quickest path to financial freedom: a rental portfolio. Growing a portfolio of rental properties will depend entirely on how much you need to make to realize financial freedom. For many, the more properties, the better. However, to get a more specific idea of what your own goals should be, try to first match your current earnings. Let’s say a person hoping to achieve financial freedom currently makes about $100,000 working a typical nine-to-five. If they are looking to maintain a similar lifestyle supplemented by passive income, they’ll need to build a portfolio of properties that is capable of replacing their income. According to Zillow, the median rent price in the United States is approximately $1,650 a month. At that rate, a passive income portfolio hopping to realize $100,000 a year would need between five and six properties. It is, of course, important to note that prices will vary dramatically from city to city, and that sometimes you may only need a few properties in the right city to meet my criteria, but the national average is a safe starting point. Therefore, be sure to adjust your numbers for the city you intend to rent in. With five properties, each bringing in an average of $1,650 every four weeks, an investor stands to make somewhere in the neighborhood of $8,250 every month. Over the course of a year, those numbers extrapolate out to $99,000. Of course there are additional variables that need to be accounted for, like property management and maintenance costs, but those things can easily be offset by adding more properties to your respective portfolio; just one of the many reasons a sound passive income portfolio makes saving for retirement a reality for many. It is worth noting, however, that not every single penny of the previously mentioned $100,000 will need to be replaced, as rental properties offer tax benefits that are just as good as money. Rental property depreciation, for example, is one of the many ways rental properties can help investors reduce their taxable income, effectively saving them more money over the course of a year and increasing their chances of realizing financial freedom. The path to financial independence is a lot more manageable for those who are prepared for what will be expected of them. Understanding what it may take to rid yourself of the dependency a traditional job is a great starting point, but those who are serious about learning how to achieve financial freedom should strongly consider the prospects of a cash flowing rental property portfolio. The passive nature of buy and hold assets should be able to supplement one’s income now, and well into retirement. There isn’t a single person who isn’t at least intrigued by the concept of financial independence. Financial independence is an economic indicator suggesting someone is no longer dependent on income generated from any type of job or activity that would have them trade their own time for money. With the right plan in place, a mind for due diligence, and a cash-flowing real estate portfolio, financial independence may only be a few rental property acquisitions away.